Dementia, now known as major neurocognitive disorder (MNCD), is conceptualized as a cognitive disorder with concomitant functional impairment. Behavioral disturbance is briefly mentioned in the 2013 update to the American Psychiatric Association Diagnostic and Statistical Manual. Neuropsychiatric symptoms (NPS) should be considered essential to the diagnosis, assessment, and clinical management of those with MNCD. It is the NPS that most impair quality of life for those with dementia as well as their families and caregivers. NPS are one of the main reasons people with dementia must leave their homes and enter institutional settings. 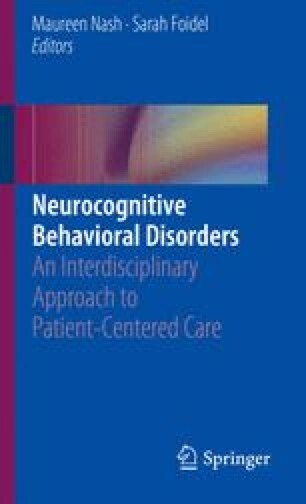 This chapter reviews the syndrome of dementia, its nature as a cognitive, behavioral, and functional disorder, and its impact on individuals. Communication can be challenging for those with dementia, and often language abilities are impaired. Some of what is referred to as behaviors related to dementia is a form of nonverbal communication. Understanding behavior as communication is required to care for those with these life-limiting diseases such as dementia. National Institute on Health and Care Excellence (NICE) guideline [NG97] Dementia: assessment, management and support for people living with dementia and their carers. https://www.nice.org.uk/guidance/ng97/chapter/Recommendations#diagnosis. Last accessed on 13 Nov 2018. Published date: June 2018. United Nations report on World Population Prospects. World population prospects: the 2017 revision, key findings and advance tables. United Nations DoEaSA, Population Division (2017). Available online at: https://esa.un.org/unpd/wpp/Publications/Files/WPP2017_KeyFindings.pdf. Accessed 25 Sept 2017. World Health Organization. 10 Facts on Dementia. Updated April 2017. https://www.who.int/features/factfiles/dementia/en/. Last accessed 24 Nov 2018.